Of course! Herbert and Gerbert! From up the road! How could we forget! Now, whilst I wouldn’t describe our setting as being entirely bucolic, we do have some fields surrounding us and there is a smallholding nearby, so it was obvious what happened. Herbert and Gerbert had escaped. So I took upon myself to usher them back, which wasn’t easy. Even with the aid of two carrots, it took me nearly thirty minutes to coax them back with various people in the street waving gaily at me from their windows as I did so. Grinning and laughing at my rubbish attempts to become a goat herder. The final home stretch consisted of my pleading for them to hop back over the fence from which they came. But they just stared back at me with those devilish eyes of theirs, chewing on morsels of carrot. There was nothing for it, I had to pick them up and carry them over the threshold and as I did so, each one decided to deposit a present into the cusp of my arms before being lowered to the ground. And then, with neither a bleat of gratitude, the pair of them both sauntered off into the thicket. So I shouted at them “Next time, you two might not be so lucky.” All whilst smacking my lips and brushing muck off my jacket. The curious thing though is that I don’t think I have eaten much in the way of goat. Bar a typical goat curry here and there and it was only after another chance encounter of passing the butcher’s window at the Quality Chop House Shop in Farringdon, London, that I actually bought some to cook with. 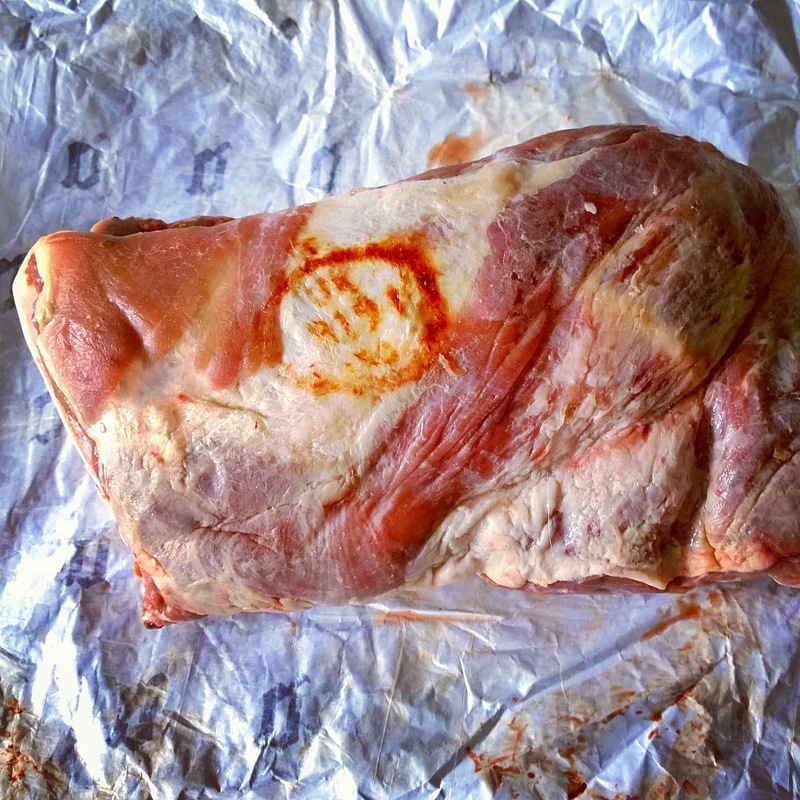 The goat in question came from Cabrito Goat Meat, who are based in Devon and source their goat, or kid meat, by raising billies across various farms in the South West. Billies that ordinarily would be culled at birth. Within the dairy industry, boy goats are deemed as waste and yet to immediately sideline them out of the food chain seems even more wasteful. So for Cabrito to transition them out of the system and give them longer, happier and more purposeful lives should, in my opinion, be applauded. I found this all out by looking at their website by the way. Back at the butchers, my general enquiry went along the line of “Um, I’ve never cooked goat before, what cut should I take?” and after much consultation with my bearded, sombre friend, we decided on half a shoulder, to be roasted long and low. 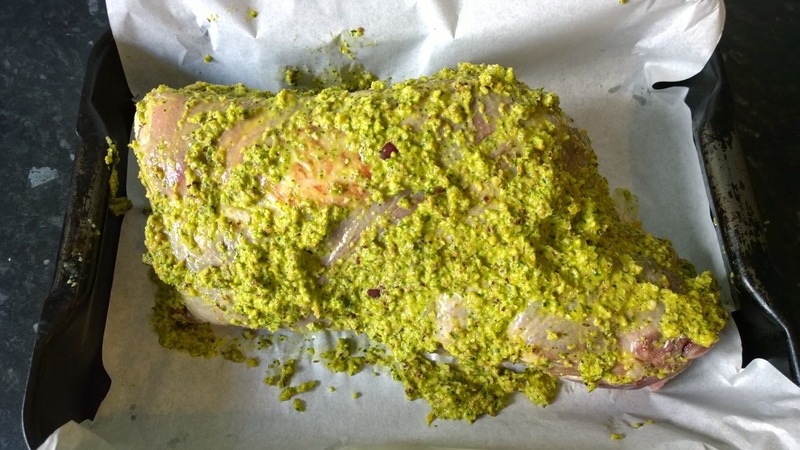 That was before Christmas and it has taken me nearly three months to getting around to doing anything with the joint (don’t worry, it has been in the freezer) but we had a good go this week, treating it with a Middle-Eastern makeover and I have to say, it was delicious. The meat itself was sweet and delicate and totally without that cloying undertaste you sometimes get with lamb. 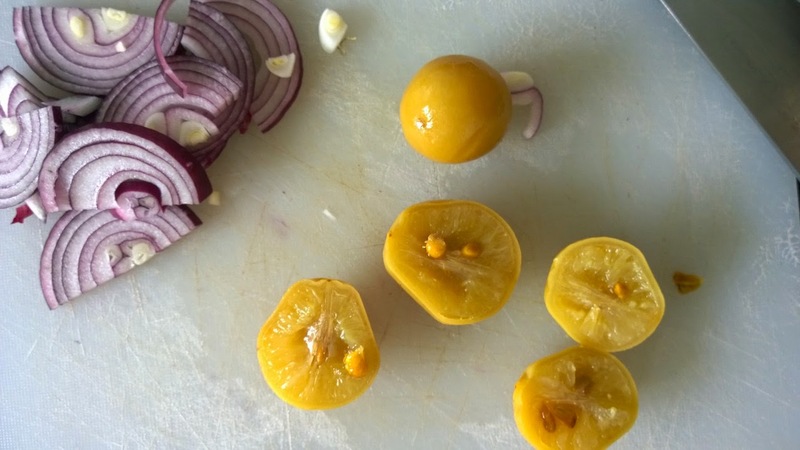 Coupled with the preserved lemon, garlic and coriander, the overall effect is intensely aromatic and the smells in the kitchen will get you salivating in no time at all. I served it up with some plain couscous and a herby salad, but I reckon roasted peppers and aubergines wouldn’t go amiss here. 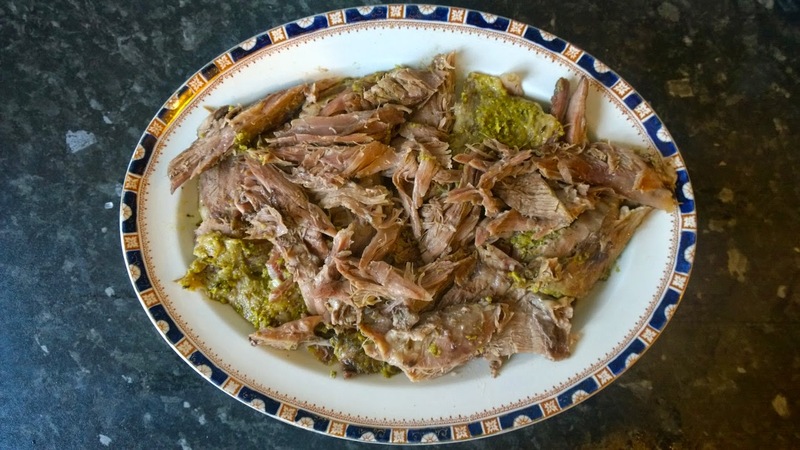 And be sure to save the leftover gravy that resides in the bottom of the roasting tin, to drizzle over the meat and use for dipping a day or two afterwards even, using slices of toasted pitta. As for Herbert and Gerbert, they are safe for the time being but if they escape one more time and start chomping at my grass again; well, I will not be responsible for my actions. 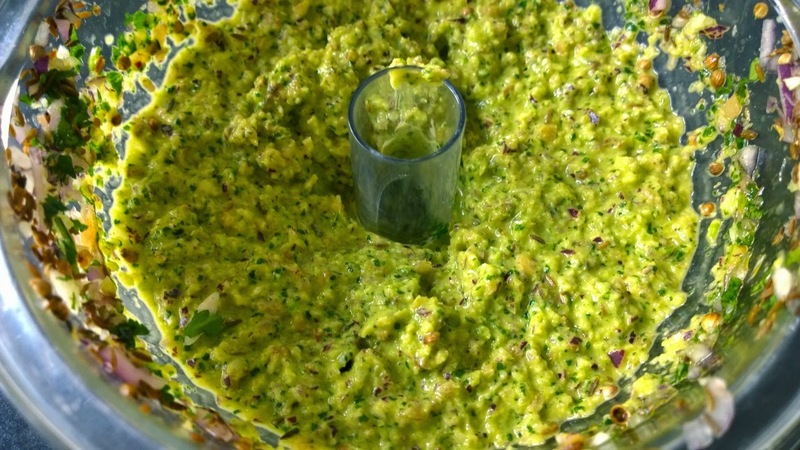 First make the marinade for the goat by placing the preserved lemon, onion, garlic, coriander and olive oil into a food processor and blitz to make a paste. Toast the coriander seed and cumin in a dry frying pan on the hob for a minute or two and then grind as fine as possible using a pestle and mortar (or spice grinder!) and stir into the paste. Add a good amount of seasoning and then spread the paste all over the shoulder joint. Leave to marinade for two hours in a tray or bowl. Meanwhile preheat your oven to 220C. When ready, take a roasting tray, cut out a long sheet of greaseproof paper and line the tin with paper overlapping on either side. Place the goat in the middle, scraping out all the excess marinade and smooth all over. Pour the water around the sides and then wrap the paper around the joint (think en papillote). Then seal further still by covering with a sheet of doubled up foil. Place into the oven, immediately reduce the temperature to 140C and slowly cook for 3-4 hours. 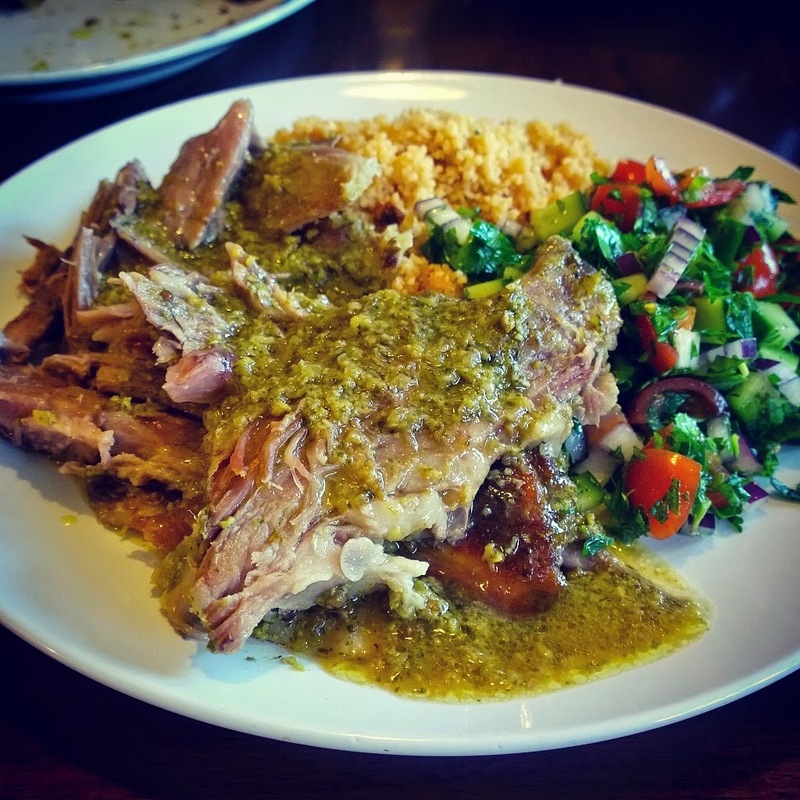 When ready, the meat should be practically falling off the bone so slice or pick off carefully and serve with couscous, a herby salad and plenty of the remaining gravy. *For the record, Herbert and Gerbet are not their real names. Fin named them as such that day and we still don’t know what their real names are. 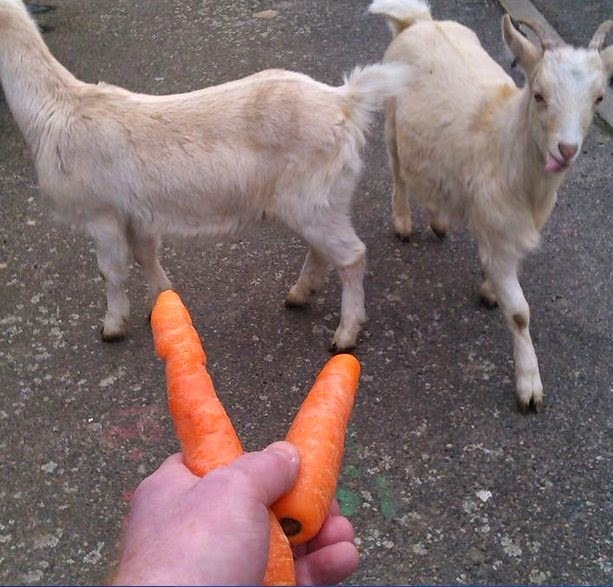 Great post - inspires me to get myself some goat. 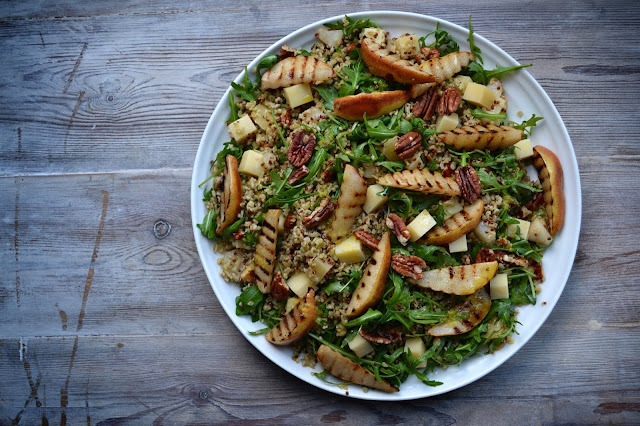 Dish sounds and looks ridiculously delicious! That aside though, HAHAHA at the goat story. My word Danny that looks incredible. 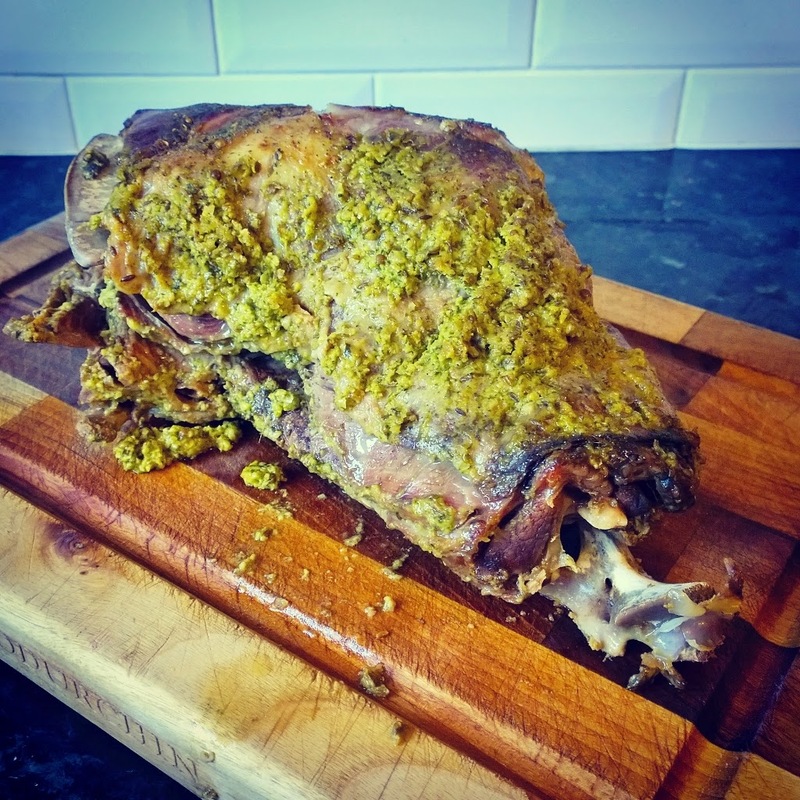 I've done lamb in various ways, and i've eaten goat a few times but this needs to be tried.